Actors’ Theatre has gone through quite an evolution. 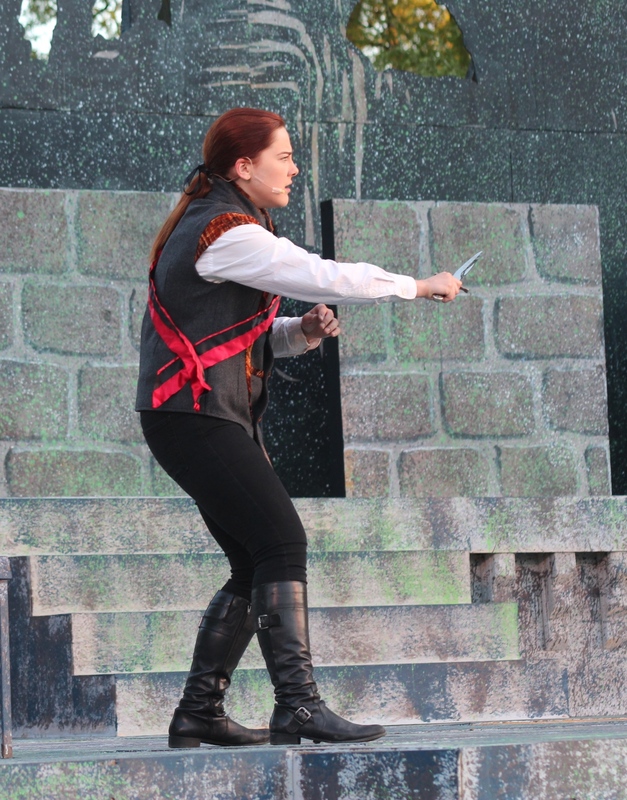 Shakespeare in the park has always been the troupe’s bread and butter, but recent years have seen the Bard’s stage time reduced. In his place, Actors’ has tried to attract families with swashbuckling adventures, some of them written especially for Schiller Park. Vintage comedies by other playwrights, such as the current production of Moliere’s The Miser, have also been tried. It’s been an interesting experiment, and no doubt it’s paid off in some ways. For one, the kids who enjoy plays such as Treasure Island (2010) or Robin Hood (2012) may well return to the park when they’re older to watch more-challenging works. But where does that leave those of us who already enjoy more-challenging works, especially those written by one William Shakespeare? We’ve had to get by with a single helping of the Bard per summer. Adding insult to injury, that single helping is sometimes delivered in a high-concept production that overwhelms the original tale. This summer saw an unconvincing attempt to turn Richard III into an American gangster saga. And in 2013, the charming Twelfth Night was raucously updated to the 1980s, complete with pop-culture references to Miami Vice and Ghost Busters. It’s almost as if Actors’ Theatre has decided it can’t sell Shakespeare without a gimmick. But Shakespeare still works just fine on its own, as last year’s outstanding production of Hamlet proved. Sure, it had a gimmick of sorts, in the form of the untraditional casting of a teenage girl (Grace Bolander) in the title role. But the real “gimmick” was talent: Under the co-direction of Nick Baldasare and the late John S. Kuhn, every member of the cast found depths of nuanced meaning in each and every line. That’s not to say there’s no value in giving stage time to other playwrights. It was certainly educational seeing the current production of The Miser. Namely, it taught me that Moliere is no Shakespeare. To be fair, I might appreciate Moliere’s satire more if I could enjoy it in its original French. In Miles Malleson’s English adaption, unfortunately, it often comes off as heavy-handed and predictable. Compounding the problem, some of the scenes are delivered in an exaggerated farcical style that underlines the comedy’s heavy-handedness. Especially guilty of this approach are Ted Amore as the stingy Harpagon and Danny Turek as his lovelorn son, though both are otherwise impressive. Working under Pamela Hill’s brisk direction, most of the cast members are more restrained. They include Andy Falter as the brown-nosing Valere, David Harewood as the devious LaFleche and Michael Neff as the eager-to-please Master Jacques, along with all of the major female players: Elizabeth Harelik as Harpagon’s daughter, MB Griffith as matchmaker Frosine and Lexi Bright as a young woman caught in a romantic bind. The show also benefits from Trent Bean’s colorful set, Emily Jeu’s imaginative costumes and sparkling clear sound designed by William Bragg and engineered by Catherine Rinella. Yet, despite all of these strengths, the production is truly funny in only one scene toward the end, when a trio of actors offer deadpan deliveries of monologues accompanied by equally deadpan background music. Otherwise, the show is merely pleasant. Pleasant entertainment is better than none at all, but I’d rather be challenged, touched and transported, as I am by a good production of Shakespeare. How about it, Actors’ Theatre? Is it time to return the Bard to top billing? 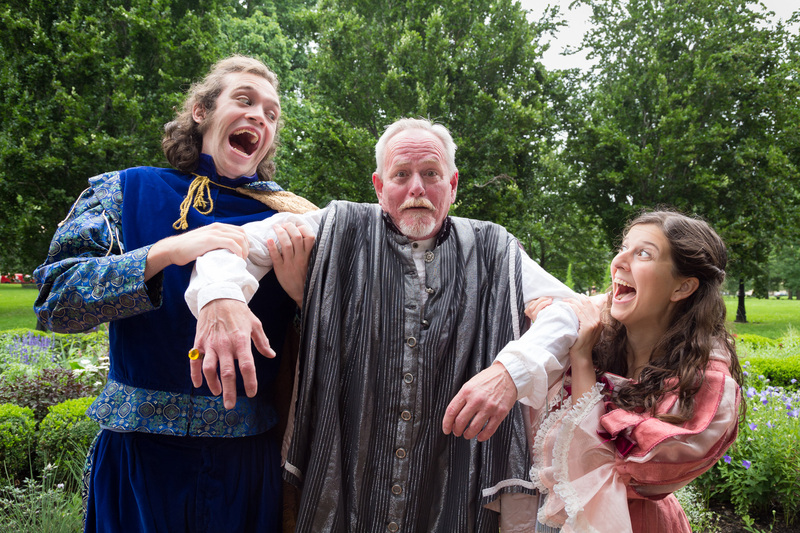 Actors’ Theatre will present The Miser through Sept. 6 at the Schiller Park amphitheater, 1069 Jaeger St., Columbus. Show times are 8 p.m. Thursday-Sunday. Running time: 2 hours, 10 minutes (including intermission). Tickets: Pay what you will. Bring a blanket or lawn chair. 614-444-6888 or theactorstheatre.org.